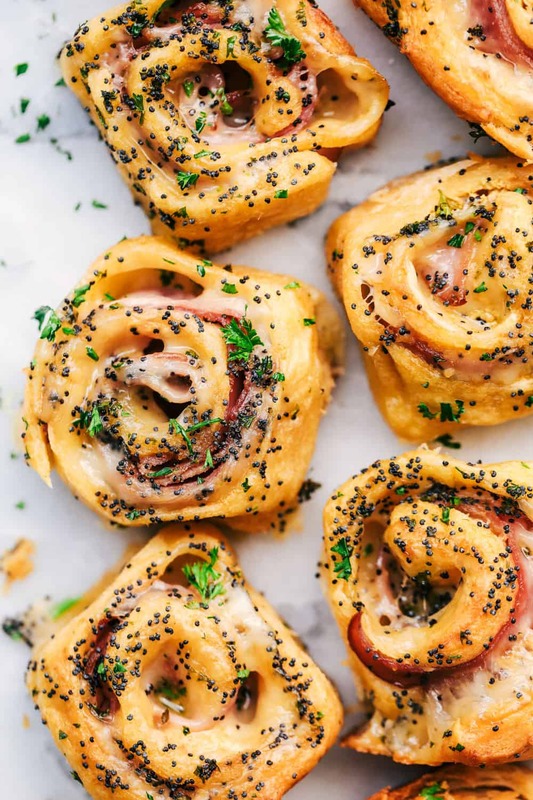 Hot Ham and Swiss Pinwheels have smoked ham and melty swiss cheese that are rolled up in croissant dough and are brushed with a buttery garlic poppyseed topping! The perfect insanely delicious quick and easy dinner or appetizer! School is starting for us next week and I can’t believe it. We are so ready for it to be back in session. We all know how crazy life gets when school starts and I am all about the quick and easy meals. My boys enjoy cooking so much in the kitchen that I gave them a day two nights a week to make something that they love. We always make these hot pinwheels at our house. 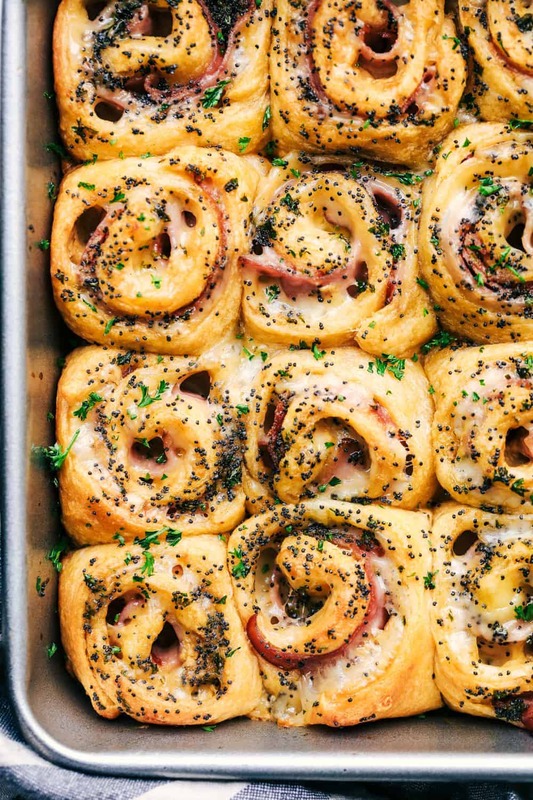 We have stuffed them with pepperoni and made pizza pinwheels, but our favorite variation is these hot ham and swiss pinwheels. You can’t beat the ham and melty swiss cheese combo. 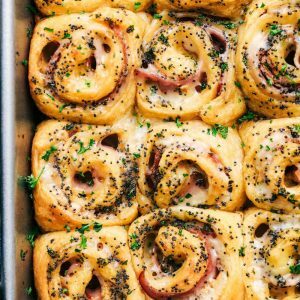 Plus– that garlic butter poppyseed topping! It is amazing! I have one of our families favorite secret ingredient in the topping, and these truly are the best. These are so perfect for a quick meal or a party appetizer favorite! 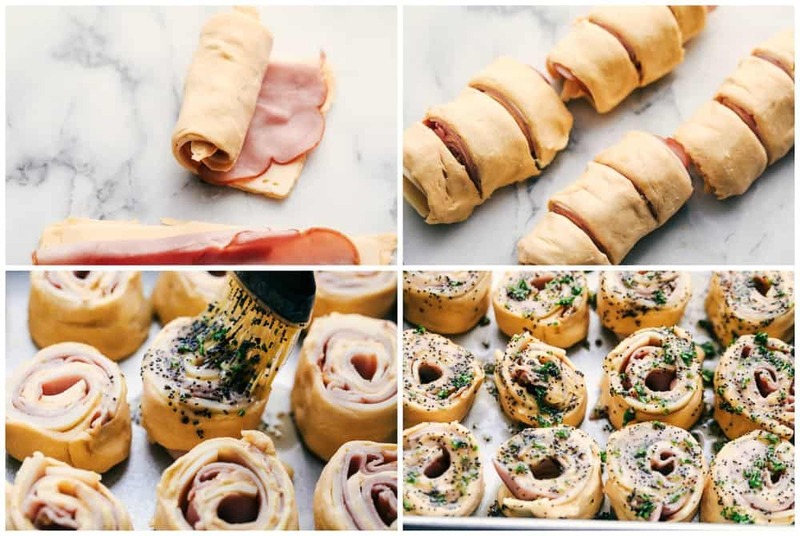 How do you make hot ham and swiss pinwheels? Start by unrolling your croissant dough and divide it into 4 sections. Pinch the seams to seal and spread about 1 heaping teaspoon of dijon mustard on top. Add 2 slices of swiss cheese and smoked ham on top. Roll up each rectangle and seal the seam. 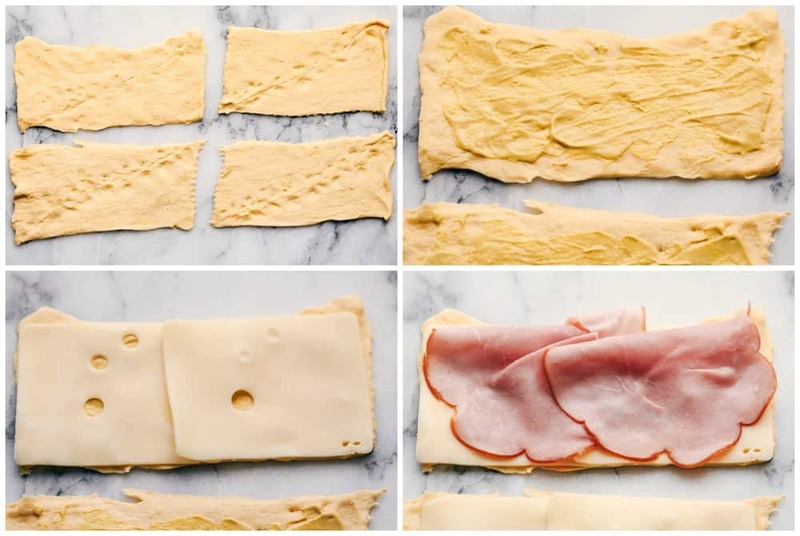 Cut each roll into 3-4 slices. Place on a greased 8×8 inch pan. Brush the tops with the buttery garlic butter poppyseed spread and bake. How long does it take to bake a pinwheel? Bake in a preheated 350-degree oven for 13-15 minutes or until puffed and golden. What is the best ham to use? A high-quality deli ham is best to use. We like to use smoked ham, but it is whatever your family prefers. 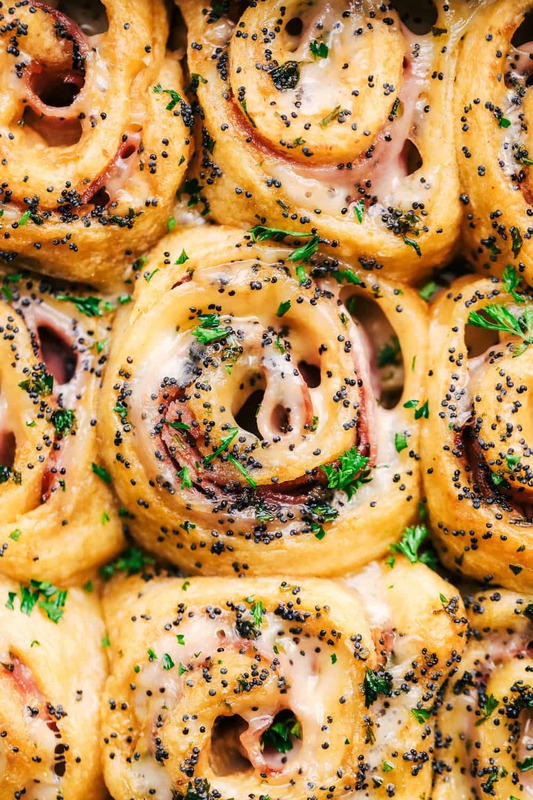 These delicious ham and swiss pinwheels wrapped up in a butter garlic crescent are to die for. They were gone in minutes at our house and we all can’t get enough when we make them. I know that your family will love these just as much as we did. You also can do this with pie crust. Wow…This is amazing recipe. I really love it the ham, the cheese and the “yummyness” of this picture, Its really delicious. Thanks for sharing.